Charis turned three on Sunday! Can it really be that my baby is three? It's SO hard to believe. We were in Pennsylvania for her birthday for my brother's ordination at a PCA church plant in Pittsburgh. It was a FLYING trip. We got in at my parent's house around 11:00 PM on Saturday and arrived home at 1:00 AM on Monday in Maryland. Monday=Exhaustion for all of us. Thankfully, Charis took a 5 hour nap. I was only able to rest for about two hours. 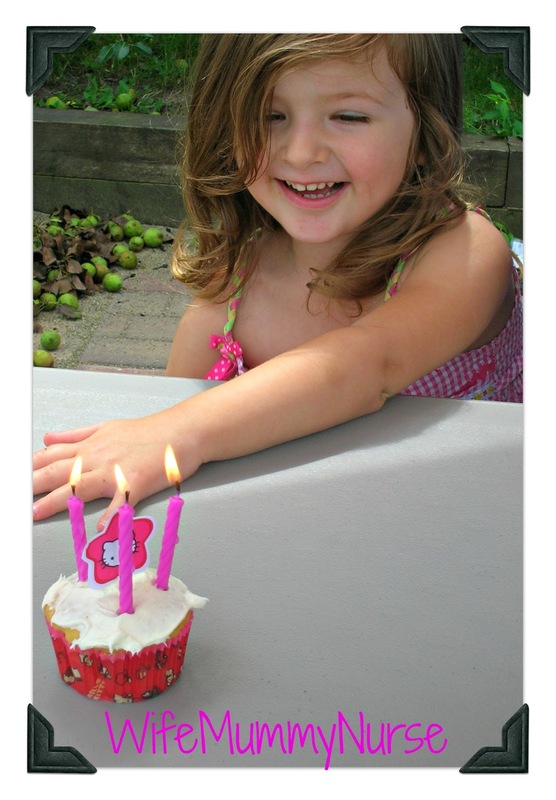 Granny made Hello Kitty cupcakes for Charis, and she blew out three candles. Okay, actually it was my dad who blew the candles. Charis was clueless about what she needed to do. If we're still in MD in two years time, I'll start homeschooling her. I'll need to double check on the state laws on reporting, etc. Which is rather daunting. How do you choose a curriculum? How do you choose a method? Meanwhile, I keep praying, "God help me." My daughter's turning into a young lady. No, she's not completely potty trained, but she loves helping "mama". Where did "mama" come from? I NEVER told her to call me mama, but she does. I think it's rather cute, but I'm still uncertain about the source. She looks so grown up, Sarah! My daughter will turn 3 in January. I'm so not ready! But I think she will have Hello Kitty cupcakes too! My boys are 3 and (soon-to-be 5)...time flies! What a pretty, grown up little girl! Aww they grow up too quickly! Happy Birthday Charis! Absolutely beautiful! I agree with you on homeschooling in MD -- I vowed to do the same if we were still living there. She looks so beautiful! And I love the thoughtfulness of the Hello Kitty cupcakes :) That's so sweet. Good luck with your homeschooling adventures - can't wait to hear about it! Happy Belated Birthday!! She looks so happy. Hope you all had a wonderful time.